When I was a kid, we always had two pies after holiday meals, pumpkin and mincemeat. I liked both of them. 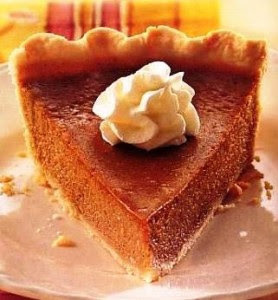 Years later I tasted sweet potato pie, which is quite similar tasting to pumpkin. I came to realize the key taste was due to the exotic spices in both pumpkin and sweet potato. So it is six of one, I enjoy them both. I also remember a woman in Mississippi who baked “Bean Pie” which tasted like the aforementioned pumpkin/sweet potato pies. When I inquired as to why pinto beans, she said she “didn’t have no sweet potatoes around, and it sure ain’t pumpkin season”. She said all she did was make a puree of the pinto beans and take it from there. I asked about the taste and she explained that the spices nullified any bean flavour. She was right. Recently I baked a Pinto Bean Pie myself and it was so good that, to use an old expression, “It’ll make you want to slap your mama”. If you have pinto beans on hand (and who doesn’t), you can make this tasty dessert, which happily contains the nutritive bonus of the legume. Clean, sort and soak 1 cup of dried pinto beans overnight, or quick soak by bringing soaking water to boiling and then let beans sit for 1 hour. Now, in a medium saucepan, cover pinto beans with water, ½ teaspoon of salt and 1 tablespoon of vegetable oil. Bring to a boil and simmer until beans are tender, about 1 hour. Or pressure cook about 6 minutes, quick-release the pressure and taste for doneness. Drain the beans but reserve the liquid. Put the pinto beans in an electric blender with a little of the reserved liquid and blend till smooth. This makes about 2 cups of puree. Preheat oven to 375F (190C). Beat eggs well in a large bowl. Now add the puree, milk and cream. Stir until smooth. Add salt and sugar and the spices, stirring until thoroughly blended. Pour into the pie shell and bake for 1 hour. Check doneness by sticking clean knife blade in centre. It should come out clean. Cool to room temperature. Chill the pie and when you serve it put a spot of whipped cream on each wedge. That Pinto Bean Pie is good groceries, I tell you.